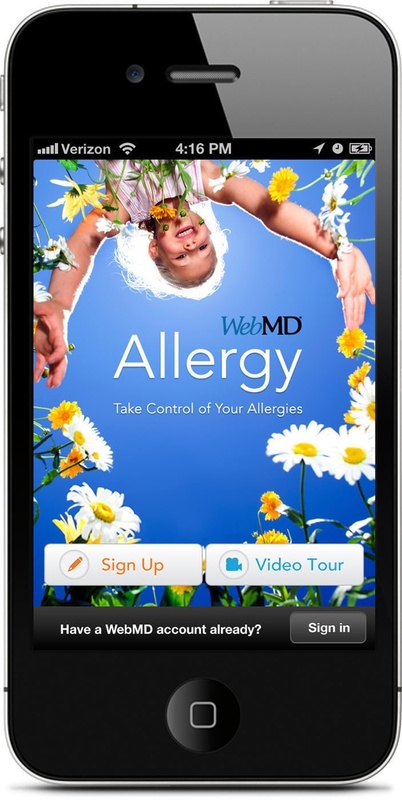 NEW YORK — WebMD Health Corp. , the leading source of health information, announced today its new WebMD Allergy app for the iPhone, an innovative new mobile resource that empowers consumers to take control of their allergies. It is the first free app to provide allergy sufferers with personalized location-based allergy condition forecasts in combination with WebMD’s trusted information and insights. WebMD Allergy is further personalized with optional mobile push notifications that warn when allergen levels are high, enabling app users to proactively manage their allergy conditions. Over sixty percent of WebMD visitors report allergies that moderately or severely affect their lives. (1) WebMD Allergy delivers customized health and wellness information to consumers looking to identify and manage seasonal, food, skin, drug, insect bites or stings, and latex allergies. The app also tracks allergies for multiple family members, so parents can take an active role in managing their children’s allergies. Scheduling allergen alerts. Push notifications on high allergen levels in your area, delivered to your iPhone’s home screen in the mornings, to better prepare you for the day. WebMD Allergy is available for free in the Apple App Store or at www.itunes.com/appstore. Detailed information on the app is available at www.webmd.com/allergy-app. WebMD Allergy Health & Wellness Survey Methodology WebMD conducted a survey of its mobile consumers (mobile web and mobile app) to better understand which key factors allergy sufferers are looking for in a mobile app. Recruitment to the survey was implemented via the WebMD mobile web site and WebMD app.